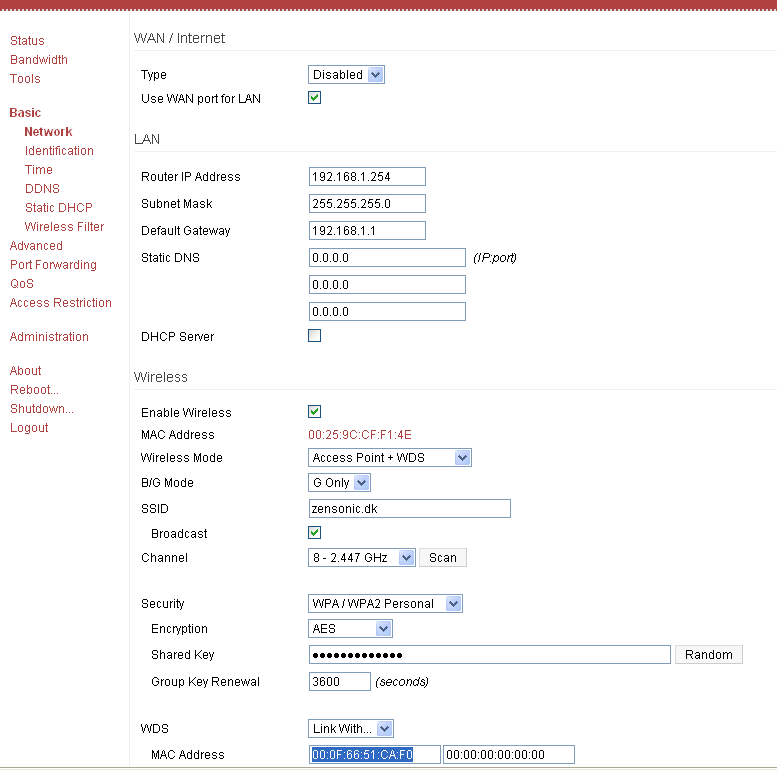 Setting up 2 Linksys wrt54g(l) in a WDS with the tomato firmware. Since 2004 I have been using a Linksys wrt54g as my access point at home. Having tried a lot of different firmwares (original linksys, sveasoft,DD-WRT, OpenWRT) over the years, I eventually settled for the nice and easy tomato firmware in 2008. A little bit of planning before we embark. The original AP (AP1) has ip address 192.168.1.1, runs a dhcp server and has a WAN connection on the “outside”. The new AP (AP2) are going to get ip address 192.168.1.254, not run a dhcp server and have no WAN connection. With that in place, here is how I did it. Get access to AP2. I connected the the AP back to back with a PC powered on the AP, held the reset button in for 30 seconds and then released it. That resets all settings in the AP making it possible to log in as the default admin/admin user if it is the original linksys firmware. It was in my case. Flashing AP2 with a new firmware.Â I downloaded tomato firmware 1.27 from polarcloud. After unpacking the firmware I simply upgraded/reflashed the AP using the inbuilt webserver. No fancy trickery there. Under basic/network, disable wan, check use wan port for lan, set router ip address to 192.168.1.254, set default gateway to 192.168.1.1 (ip address of AP1), set the Wireless mode to Access Point + WDS. 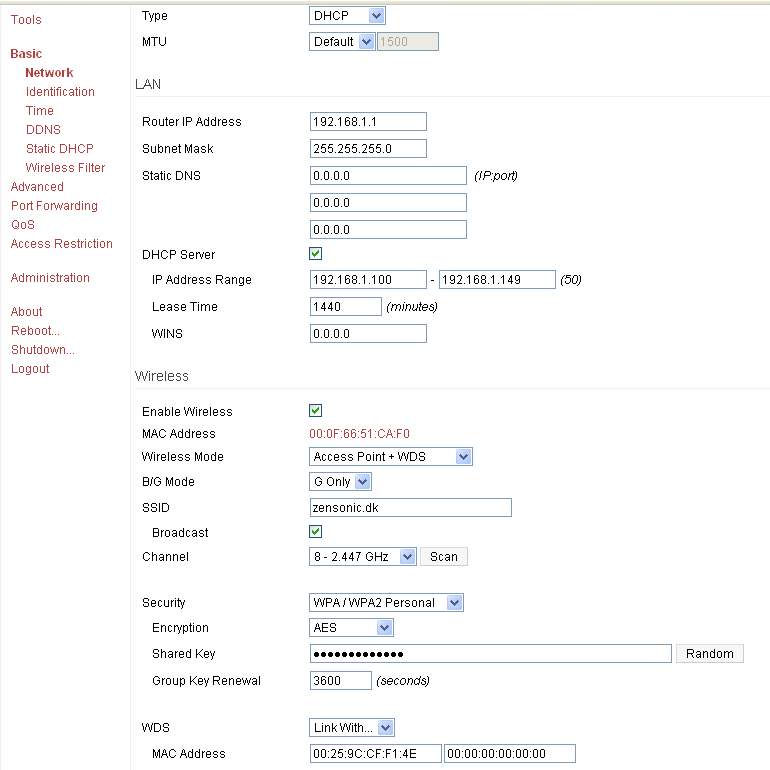 Under basic/network, set the SSID, the channel and encryption as AP1. Under WDS, update the “Link with” list, with 00:0F:66:51:CA:F0, which is the mac address of AP1.